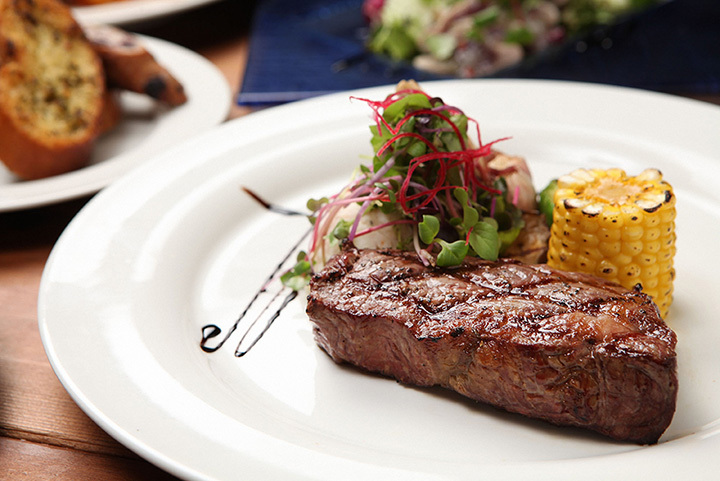 Next time you’re looking for a juicy steak, remember, Maine is a foodie state! Just look at Portland, home to more restaurants per capita than New York City. Whether you’re in Portland, Bangor, Fort Kent, and beyond, you’ll find a delicious steak at a classic restaurant. Here are our 10 favorite steakhouses in the state. Joseph’s is Central Maine’s best locally-owned steakhouse featuring an inviting atmosphere with two wood fireplaces and a year-round climate controlled outdoor deck overlooking the Pine Ridge Golf Course. Joseph’s only serves Braveheart Black Angus Beef, which provide a finely-textured marbling and juicy, tender flavor. You’ll find every kind of cut you want from sirloin to ribeye. Ranked as one of the best steakhouses in New England, The Steakhouse in Wells is a popular spot to grab a juicy steak after a day at the beach. The Steakhouse carefully selects your steak as the meat is hand-cut on-site and broiled in extremely high-temperature broilers to produce the juiciest steak you’ll ever try. Part of the famous “room” family, the Grill Room & Bar focuses on wood-fired meats, fish, and pizza. Chef Harding Lee Smith uses grass-fed beef and locally grown organic meats whenever possible to tantalize your taste buds. Choose from a hanger steak, sirloin, filet mignon, or ribeye. you won’t be disappointed. Mac’s Grill has served over 1.5 million pounds of angus beef over the past 20 years in Auburn. Local customers and visitors have loved the delicious steaks, fresh seafood, and seasoned chicken dishes that keeps this busy steakhouse running seven days a week. Their hand-cut sirloin steaks are some of the best around. Only in Maine would you visit a steakhouse by snowmobile. Little Eustis, Maine doesn’t have a lot on the map, but it does have several busy snowmobile trails. Trail’s End is one of the destinations for many of Maine’s snowmobilers as the food is good and fills you up to head back out to the cold. The prime rib is a popular choice. If you love surf and turf then J.R. Maxwell & Co in coastal Bath is the place to go. Located in the heart of downtown Bath since 1979, J.R. Maxwell has been serving up mid-coast Maine’s best seafood and steak dinners. They only serve the best black angus steaks available and their Friday and Saturday roast prime rib is not to be missed. In true Portland foodie fashion, Timber Steakhouse is a true delight for any steak lover. While the prices are up there, the steaks come from grass-fed, all-natural beef from Maine. And you can’t beat the delicious selection of side dishes to pair with your steak. Save Timber for a special occasion. Brahma Grill and Tavern is one of Bangor’s finest restaurants serving gourmet angus beef, wild caught seafood, and local produce. Steaks are reasonably priced for an upscale restaurant and can be topped with a choice of portabella demi-glace or Brahma steak sauce. You won’t regret your choice of steak here. Bullwinkle’s Steakhouse is your local neighborhood steakhouse in Waldoboro. This restaurant is reliable and friendly with great steaks. Fridays are prime rib nights so get their early if you want your share before they sell out. Jack Russell’s Steakhouse & Brewery is Bar Harbor’s only steakhouse. Make a reservation as this popular restaurant books up fast during the high tourist season. All the meat is good here, but we recommend the Jack Russell’s Signature Steak, which is your choice of filet mignon, New York sirloin, or ribeye grilled at 2,000 degrees to lock into the black angus flavor. Don’t forget to try their freshly baked pretzels!